The rash of bankruptcies and other difficulties facing the state have led to changes and reinforcements of laws applying to gift cards in California. Gift Card Granny examined these laws for California’s shoppers. 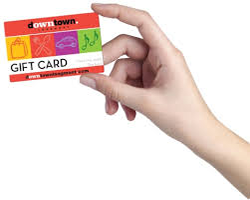 For state by state specific law concerning Gift Cards you can check out this resource. 1. Gift Cards: California law protects those who give and receive gift cards from fees related to expiration dates and dormancy, but it’s important to understand when such protections apply and when they don’t. Consumer protections vary depending on both the type of business from which the card was purchased and on the type of merchandise or service for which the card is used. Both California and federal law prohibit the sale of gift cards and certificates in a deceptive manner, so the company or person selling the card can’t conceal fees, conditions or restrictions. 2. Mall/multiple-store gift cards: California law allows merchants to impose service fees and expiration dates for cards that can be used at multiple, unaffiliated businesses. As a result, you’ll find such fees and restrictions apply to most of these cards. If the balance is $10 or more, a business doesn’t have to redeem a gift card or the balance left after a purchase for cash. The store may redeem it for another card with the remaining value. However, cards with a balance of less than $10 may be redeemed for the remaining value if the consumer asks. This avoids the problem of spending additional money on a purchase when it’s difficult to find merchandise priced lower than $10. 4. Bank gift cards: Because bank gift cards can be used at multiple, unaffiliated businesses, California law regarding expiration dates and service fees doesn’t apply. However, California does require expiration dates be printed on the card. Bank gift cards are both flexible and convenient as they usually tap into a leading credit card network and can be used at many stores. Lost cards usually are replaceable for a fee. Banks can also charge fees for purchases, monthly activity, inactivity, transaction, balance inquiry and replacement. That’s a lot of fees. Shop around for the best deal, keep your receipts and record the card balance as you would would with a traditional credit card. 5. Bankruptcies: When Circuit City closed its doors in 2008, the value of gift cards for those stores disappeared. Card holders either had to file a claim with the bankruptcy court to redeem their credit or say goodbye to their gift card credit. Unfortunately, card holders are considered unsecured creditors and usually sink far down on the list of creditors. If you hear rumors of bankruptcy, it’s best to use your gift card as soon as possible.